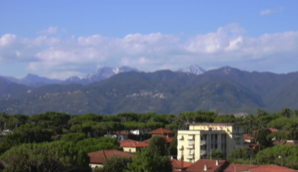 His first stop in Bagni di Lucca was the Parco di Fiori, where together with his family he was to meet members of the Italian army and dignitaries from the local council. 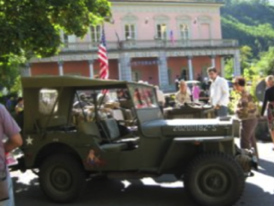 There was a great deal of interest in the village as army jeeps and personnel could be seen en route to the park and ‘phone calls were made to track down the expected time of arrival of this special guest. 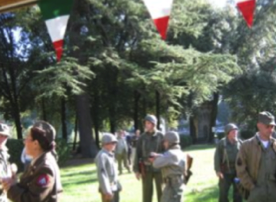 Members of the Borgo degli Artisti provided breakfast, and there was much anticipation and camaraderie between soldiers, officials and artists as they waited. Finally he arrived, family in tow; a tall, sprightly 87 year-old, pleased to be back and to receive this warm and informal welcome. 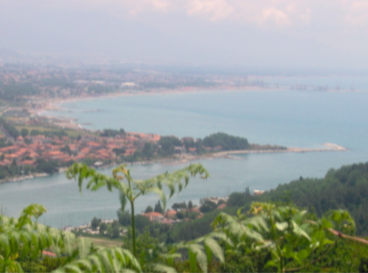 As we sipped our espresso, taking in the peace and beauty of our surroundings, it was hard to imagine the 19 year-old, as he was in 1944, far from home and heavily embroiled in fighting an ugly war. 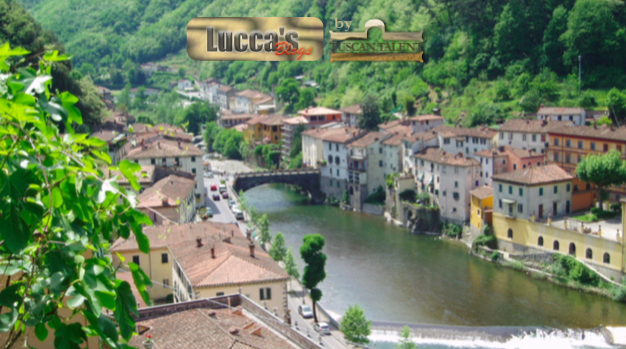 In August of that year he found himself stationed at Cascina, near Pisa, on the banks of the river Arno. Houston was part of the Buffalo division of the American army, formed in the spring of 1944 after the government had bowed to pressure from the Afro-American community and allowed them to take part in active combat in Europe. His regiment’s mission was to cross the River Arno and break through the German’s highly fortified Gothic line which stretched hundreds of miles from the sea to the Apennines, an operation the Germans called Desert Storm. Towards the end of the war, the Buffalo soldiers went up the Garfagna, and entered the Magra river valley where they surprised the Germans. 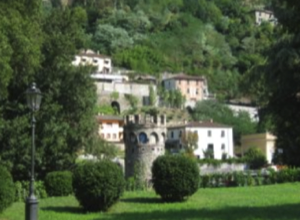 They took Aulla, Terrarossa and liberated Pontremoli in 1945. The majority of these men were young, untrained black Americans who were lacking in education, but a small number including Houston were college men. He was the division’s intelligence officer, recorder and radio operator and as such kept detailed records which he documented and used later in his book, Black Warriors: Buffalo Soldiers of World War II. 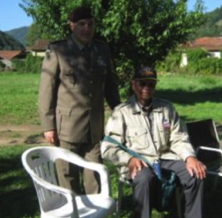 This is an autobiographical memoir, giving an accurate account of the activities of the only Black infantry regiment to fight in Europe and is an important piece of history. Houston’s description of the exploits of his fellow black soldiers makes for compelling reading. It also disputes allegations made by their white commanding officers that black soldiers were cowards and would not go forward and fight. Records show that there was no shortage of valour and courage displayed by these men, and they eventually were successful in helping to ensure the defeat of the retreating German army. Statistically, there were nearly 13,000 Buffalo soldiers who saw military action and almost 3,000 were killed, captured or wounded. They broke through the Gothic Line, reaching their objective and capturing or helping to capture nearly 24,000 prisoners. 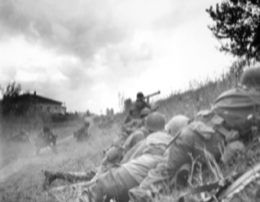 Receiving more than 12,000 decorations and citations for gallantry in combat, they had more than proved their worth during this hard and bitter Italian campaign. 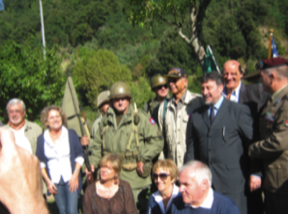 Houston also tells of the invaluable assistance of the local Italian partisans, crucial for their success. Once the war was finally declared over, the Italians cheered the black troops, treating them as heroes and expressing their gratitude for their valour in fighting the Nazis and Italian fascists in the rugged terrain of the Northern Apennines, and in villages like Pietrasanta, and in the Serchio river valley. Houston among others could see the intense irony of this. The soldiers were being showered with affection by the Italians, who regarded them as their liberators, whilst in America they were still regarded by many as second-class citizens. He felt that on the one hand they were fighting the Nazis, on the other, racism, not only at home but also in their own regiment. However, today Houston, who was wounded during the war and awarded the Purple Heart for courage and valour, was being treated as a celebrity! 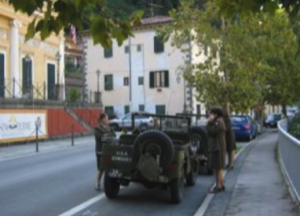 After receiving a warm welcome from those waiting to meet him in the park, everyone eager to take a photograph, he went to the Circolo dei Forestieri in the village and finally to the Terme where he was given lunch, and a film was shown about the exploits of his old division. On this peaceful sunny day, with the history of the two nations in mind, this visit helped us to remember not only the turmoil of the past, but also its valiant heroes, and to celebrate the present and hopefully too, the future.